Since its formation in the early 1880s Telford Park has had a lively history – far livelier than can be done justice to here. The below is a brief summation of long-time member Keith Browning's insightful, entertaining and incredibly well-researched history of the club, Advantage Telford. 1877: The All England Croquet and Lawn Tennis Club is formed in SW19 – later that year hosting the first ever lawn tennis championships. 1878: Distinguished architect (and tennis fan) EJ Tarver finishes the first properties on a new residential estate he has been commissioned to design in Streatham. 1880: The central feature of EJ Tarver’s estate is complete – a group of tennis courts for use by local residents. 1884: Telford Park Lawn Tennis Club is officially founded – making it the second oldest club in London, preceded only by Wimbledon itself. 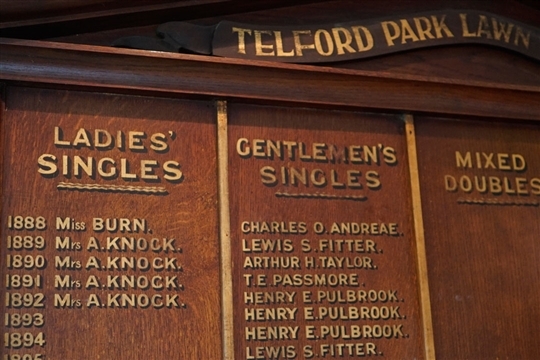 1909: By now Telford Park is a thriving tennis club, with its illustrious Finals Days being attended by several hundred spectators who come not just to watch the tennis but for the music and dancing that follow late into the evening. The 1909 final, held after two weeks of continual rain, attracts over 500 visitors – even though many of the events were far from complete. 1914: The club’s long-serving groundsman Charles Basham battles torrential floods to keep the courts playable. His efforts were to prove particularly significant as the intervention of war meant that this would be the last club championships for six years. 1920: A big year in the history of Telford Park. Facing an unaffordable rise in rent due to a new lease-owner, the club members, led by then-president Major Rice, come together to purchase the lease themselves – by means of a large number of £10 debentures. Later that year also sees the formation of the Streatham Hall Cup – an inter-club competition for Streatham tennis clubs. Though it has changed name since then, the competition – now known as the Milennium Cup – still runs today. 1934: The club celebrates its Golden Jubilee with a dinner at the Park Lane Hotel. 1939: War breaks out again and the club’s various tournaments are suspended until 1947. 1966: After 82 years, electricity is finally installed on the club premises. The evening to mark this exciting occasion also celebrates the official opening of the new Telford Bar – which would go on to host regular Friday Bridge evenings for many years. 1980: The club celebrates the centenary of tennis balls first being hit on EJ Tarver’s newly-laid courts – around 800 guests dressing in Victoriana to attend a fete that was reported in the press and on TV. 1981: The club’s first floodlit courts are launched with a gala tennis evening. 1986: A fire destroys the clubhouse – though fails to damage the priceless Rolls of Honour housed inside it. 1999: Our last two singles winners of the 20th century are Michaela Denkova and Casey Lyonette. 2007: Another big day for Telford Park as our new clubhouse is officially opened at a gala tennis evening during the annual tournament. Davis Cup player Andrew Castle joins the celebrations and a thankyou tree is planted to mark the enormous efforts of then-president Brigid Clarke in overseeing the build of our beautiful clubhouse. 2016: The club, with generous financial help from members and hours of hard work by Joe Steel, purchased the 999 year lease from Lambeth Council, and thus secured its ongoing use as a tennis club for the long-term. 2017 The club now has over 500 members of all ages and playing standards, who regularly, play, compete and take advantage of the excellent coaching programme.